Does anyone use a smartwatch of some description when skiing? I've been looking at the garmin Fenix range. They seem like great devices but not sure if I'm just been suckered in to a device because I'm a bit of a geek. I'd be interest to hear feedback on if they think they're a worthwhile investment? I'm not a runner or swimmer so they may see limited use otherwise. I have a fenix. Love it. Used it on 2 ski trips last year and it helped me plan an off piste morning by seeing exactly the route I’d previously taken. Also use it in fridges to see how many runs I’ve done. Use it as my normal watch as well. Sport pursuit of course. I've got a Forerunner 230 because I love gadgets. Use it mostly for mountain biking just to link to Strava but I also like the smartwatch elements (such as viewing text messages, controlling music on phone etc.). There are map options that use the data signal of the phone but I've found them a bit clunky. Used it once for skiing but for just piste stuff I didn't really see a big benefit as couldn't find a decent bit of software to view the data in. To be honest I probably don't get a huge amount of use out of it in terms of what it's intended for (the exercise bit) but I love it as a watch and rarely wear my other watches any more. I use a Suunto Ambit 3. I run, ski and hike, and use it for all of the above (tho' I also have a polar m400 which is a better running-only watch, but no altimeter etc. for skiing). Great for navigation and a fun toy, but if you don't need to navigate then its of very limited use skiing. I suppose it probably saves your phone battery to use the watch for run tracking etc., but I don't bother as I have no particular desire to count up the day's runs. Can see maps in garmin connect or strava. I’ll post some screenshots when I’m back at a computer. Yeah but the problem with strava/connect is that I don't want it to record the uplift so have to stop it at the bottom of every run, so when the watch syncs you end up with about 20 'exercises' in a row. I bought a Forerunner 235 a couple of months ago – really pleased with it. Garmin have their own app store, and there are various apps on there for skiing. I’ll test a few over the winter, I’m sure there’s at least one usable one. So far I’ve installed and been using a hiking app which has been really good. Great data recording, GPS etc. I specifically went for the 235 for the GPS and altimeter (and HR), intending to use it for skiing and touring. So I’d say go for it – just make sure that the model you buy can use the Garmin app store/Connect (not all can). Thanks so far. Good feedback. I've been looking at the Fenix 3HR. The Fenix 5X looks the biz but cant justify that price! If you have any Wiggle discount for loyalty they are giving 17% for platinum that ends today. @kitenski, thanks. Great links, will have a read. I have a Fenix 5. Use it daily as my activity tracker (steps, HR, sleep, calories etc...) and running. Have not used it for skiing yet but, one of the reasons I wanted the Fenix 5 was to track my XC and alpine skiing. It’s amazing piece of tech but if you’re only using it for skiing I think it might be too much. Looked at the Apple Watch as well but decided on the Fenix 5 as it has glove friendly operation and better battery life. My understanding with the built in downhill ski (or snowboard) widget (on the Fenix 5) is that it records each downhill run and pauses and starts a new run after gone uphill or stopped and everything saved in one activity. @Spoon, I think so too - albeit I'm using it on a Vivoactive. @Spoon, if the software works like that then it's great, the problem I had was that I could pause at the bottom of the run but when I restarted at the top it would make Strava throw a wobbly. @SnoodlesMcFlude, my 935 uploaded to Strava and seems to have no uplift and each downhill is a lap. Yep each downhill is a lap on mine from the Fenix also, couple of screenshots from Strava to show how detailed the map can go, and the laps. I use it on the ski/board setting for this. Only the up and over chair confused it. I also have the Forerunner 935. Have had it since April; absolutely love it and use it all the time, rather than just for longer runs/quality training sessions and long walks as I'd originally planned. 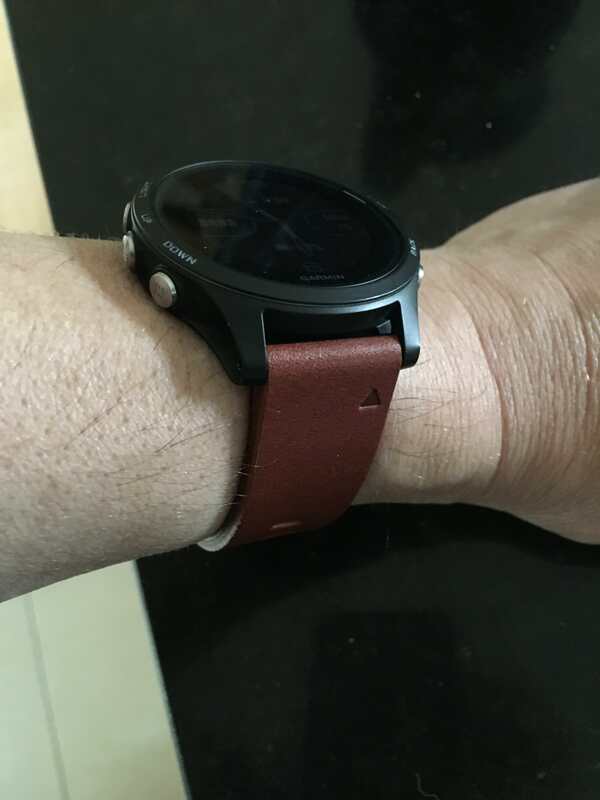 I've not used it for skiing yet, but it's very impressive for running (for which I primarily use it), hiking, general tracking of HR, etc., and the smartwatch elements are useful. Also, GPS has locked on within a couple of seconds 100% of the time so far, which is much more consistent than my previous Garmins, and there don't seem to be any weird Garmin bugs either (my older devices suffered from backwards charging and reboot loops). The battery life is insane. As said above, it's lighter than the Fenix 5, but with all the same features as far as I know - was also significantly cheaper when I bought mine, so a good option if you're looking to pay less and are happy with a more plastic build! @blacksheep, I love a good gadget as much as the next man. I had a wonderful gps thingy way back in about 2001. Triangular job you attached to your upper arm. However, I’m not convinced by smart watches for skiing. I don’t think it does anything more than you can do with Skitracks and a smartphone, and I rather suspect it does a bit less in some respects. You can upload skitracks to Strava if that’s what turns you on. I second this post. I have a Fenix, and it's great for hillwalking - tracking routes etc. Can't disagree with that re the phone, but battery life will be compromised. Before I had a fenix I put my little Garmin 510 bike computer in my pocket and used that to record my activity. Synced to laptop when back at the hotel. Worked fine, of course I couldn't read it while skiing, but I don't look at the watch either. I do like being able to look back at where I've been on previous trips. I've got a Fenix 2 which I use for running, cycling, hiking, ski touring, open water swimming. I have used it for piste skiing about twice but I find the information so boring I don't bother tracking myself when piste skiing anymore. I do wear it but just as a watch. I find the compass occasionally useful for avalanche safety use off piste. If I was skiing off piste in an area that I didn't know well then I might use way points and the altimeter a bit. My take is that it is way over the top if piste skiing is your main use. Why not just use your phone if you really enjoy tracking your ski runs? @foxtrotzulu, Agreed, I don't know why people want to map where they've been - its a bit like all the people who go to gigs and record using their mobile phone, just watch it! The memories are much more relevant than looking at a bunch of data or a video clogging up the phone. I have a Suunto, used it to measure altitude when mountain-biking a few times in the Alps and it was so wildly inaccurate (and bulky) I put it back in the box and it sits in my spare room with no battery in it! On the other hand I use a Fitbit Charge 2 (as a HR monitor, guide only) and to measure sleep and approximate steps (I don't get hung up on the exact data, and only use it as a comparison tool) and find that pretty useful. I dislike watches and bling and the Fitbit is great. If I was remotely interested that i'd done 41.333333k whilst skiing that day i'd use Strava when out on my bike - I don't bother with that either, seen too many folk trying to race their wrist rather than enjoying the ride......both on skis and bike. "My top speed is faster than yours"
Yeah, its that one that concerns me....there's too many out of control idiots out there already without being egged on by a gadget! @Markymark29, when I’m on the bike I always find it interesting to see how far I’ve been, how long it took and what speed was. However I don’t go out to achieve big numbers, I’m not a segment racer that’s looking to beat everyone. I will admit though that it’s satisfying to finish a ride and see that I’m quickest of the day though. The other advantage is when I’m following someone else or adventuring a bit, allows me to see where I’ve been. For skiing I’m less interested, but that’s probably because I’m mainly a piste skier. I don’t use ski tracks because I don’t aim to ski the furthest or fastest. Again though I’ll admit to finding it interesting when someone in the group is using it, but it’s more a passing interest rather than something I want to do the whole time. On first glance i though this was a discussion on sandwiches for skiing, after some quick thoughts about protein and slow release carbs common sense kicked in.. I use Garmin Vivoactive HR, has GPS, Skiing mode, altitude, Heart-rate etc. Works quite well although touchscreen aspect can get frustrating when skiing. I suppose the market is too small, but if you really want this stuff (and not in a phone), then integrating it with a transceiver would seem more obvious. I suppose people like me (with sensibly sized wrists and no desire for jewellery) could always stick the watch in a pocket, but "sports" watches always seem huge to me. And as I have a phone already... (yes, I know the phone interferes with the transceiver etc). I've ordered an Apple Watch series 3 today. Will see how I get on with it. I think these things are great for people that are a bit geeky and great if you like that type of detail. However, if you are only nterested in general skiing and you will use it in the bar to enforce a point then it will only increase your "bore-rating". I'm considering one of these to track my general "get fit routine". Now, I only wish my friend could get me a discount. Also, some people pay lots of money for a "non quartz" Swiss automatic watch (I prefer quartz so have a Citizen) and I would always buy a grand Seiko for that soif you can afford it then no difference buying the Garmin compared to an other quality watch. I have 2 Quartz (Seiko divers watch and a very old Luminox navy seals watch) and an automatic (Tag Heuer Aquaracer) and frankly the Seiko looks just like the Aquaracer and pi55es on it in just about every way. The aquaracer is a bit heavier which can be quite comforting but on the whole the differences are tiny except over £1000 in the price tag. So I'm with you that buying Japanese is the way forward. But I don't know if I can agree with you that buying a Garmin watch is the same as any other quality watch. A good quartz or mechanical watch will last forever not just as long as the firmware is developed for. as long as the firmware works then there isn't a problem. Part of my job is showing people how to update custom firmware. Piece of wee wee. I find that although my Garmin is quite big it’s actually fairly light so is comfortable to wear. I used to wear a watch every day but for one reason or another gradually stopped wearing them. Now that I’ve got the Garmin I’m back to always wearing one. On days that I’m likely to do a lot of walking or go for a bike ride I’ll put the Forerunner on, other days I’ll wear whatever watch suits my mood. By the way I try not to utilise the ‘bore’ option of activity tracking. Stuff gets posted to Strava and may be commented on immediately after the exercise (e.g “that was only 7 miles, felt like more” or “apparently I did 25mph, that’s bull***t, we never went that quick”), mostly the info is just for my curiosity. Just replaced my Suunto Ambit 3 with the Spartan Ultra and it's a great bit of kit, user interface has been greatly improved easy to upload routes on to it and so far pretty impressed. Got a good deal on it from go outdoors with scgb discount on the sale price. 5x is big but if you want maps it's the only choice.